Recently I read a couple of questions regarding the display of reports with a large number of columns. Basically it is not considered good practice to flood your page with loads of information, same goes for a report: the more columns your report has, the harder it becomes to interpret. That being said, many applications are data intensive and breaking up all information in manageable portions can be challenging. When it comes to a report, there are a number ways to streamline the data output. 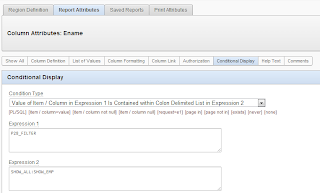 One such way is by displaying a number of columns in an inline view, I discussed that option in a previous blog post. Another way to limit the number of columns in your report considers grouping of columns and conditionally show and hide them. In this post I will explain how this works by example of the EMP and DEPT table. Note that I’ve used apex-rds* classes throughout the filter list. These classes are derived from the apex “region display selector”; this has the big advantage that we can adopt the css that goes with the region display selector, so our filter buttons will blend in nicely in our page. The html is stored in a separate html region. 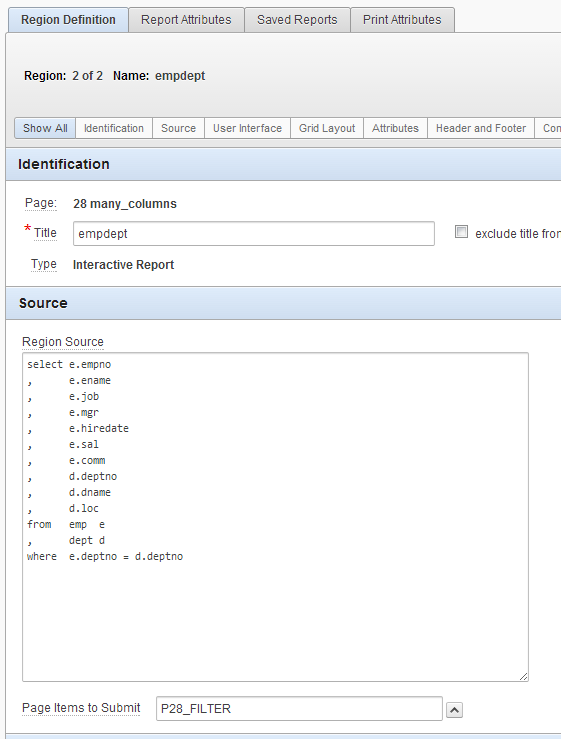 Make the html region a parent of the report region to ensure the filter tabs are visually associated with the report. The “selected”-class is a visual aid that will distinguish the selected filter from the others. On page load we all select the first filter. 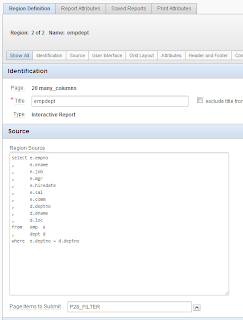 The ID of the selected filter is stored in a page item (‘P28_FILTER’). 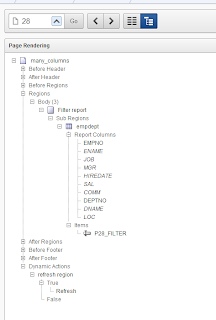 Set these conditions on all EMP columns, and do the same for the DEPT columns only replace the ‘SHOW_EMP’ with ‘SHOW_DEPT’. 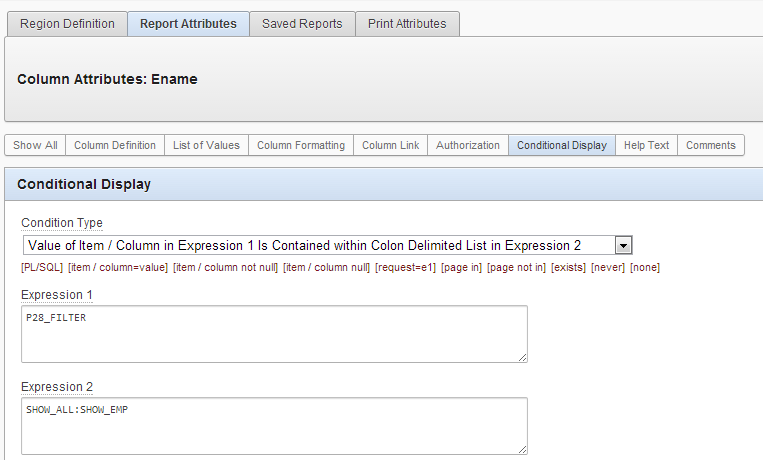 In my example I chose to always display the empno and deptno columns, so I didn't hand them a display condition. Now we have all in place and we should have a working report with filter buttons that conditionally display groups of columns. You can view a working example in my demo application.